The genre of doomed death metal has seemed to pick up speed over the last few years. Sweden of course shall give to us a supreme band in the form of THE GARDNERZ. You may dismiss the name upon first hearing it, but don’t let it fool you. 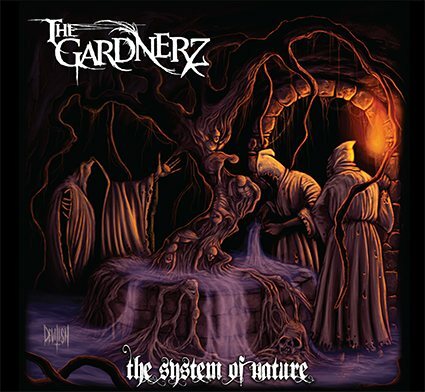 THE GARDNERZ will amaze you with their gloomy mix of death metal and doom metal on The System Of Nature. As the album begins with The Art Of Suffering you may think of Katatonia with its slow and somber guitar tones, but then the song cracks open to reveal growling death metal vocals and heavy Swedish leads. All while keeping a mid pace beat, if you can imagine that. The layers of the guitars are a dreamy sound scape of infinite melancholy. As the next song Lady In The Grave comes in we are treated to more elaborate vocals of both growling and black metal type screams, almost like a duel. Backed by intricate guitar leads that seem to mesmerize. As we go on to Shift In Thought the black metal vocals are back and the guitars are howling. Flaw In The Axiom will draw you in within the first few bars of the song, with its sorrowful and distant leads, as the song progresses into an abyss of dwelling, the ambient solo repeats throughout the song like a chorus. You aren’t going to find any fast paced songs or blast beats on this album. However, you aren’t going to find anything lame about it either. THE GARDNERZ know how to keep it heavy and they do it quite well. Think Runemagick, Amorphis and Hypocrisy if you will. There is definitely a Swedish old school sound to the guitars, and they dominate the album to their fullest potential. So many different sounds to them from acoustic to fast and heavy leads, and technically beautiful solos. Having just signed to Abyss records with Dan Swano at the controls, that should tell you right away that THE GARDNERZ are quite worthy, after only having been in existence for two years.